Viral posts on Facebook claim the actor turned politician converted to Islam and changed her name to ‘Maryam Akhtar Mir’ following her marriage to Kashmiri businessman and model. Matondkar married Kashmiri businessman and model Mohsin Akhtar Mir in 2016. The actor turned politician, best known for the movie ‘Rangeela’, is expected to contest from the Mumbai North Lok Sabha seat. BOOM got in touch with Mohsin Akhtar Mir, who denied any such conversion by Matondkar after marrying him. “It is a common trend to play up such claims before elections and we are not perturbed by any of it. My wife did not convert to Islam. Period,” Mir told BOOM. Taking cue, Mir also clarified that Urmila has also not changed her name. 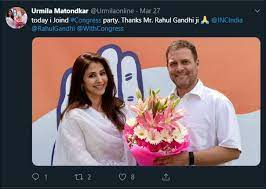 Meanwhile, Mir was also targeted in a tweet, which alleged that Urmila’s entry into politics was because of Mir’s proximity to the Congress party. #UrmilaMatondkar did Niqah with 9 yr younger Kashmiri Md. Mohsin Akhtar Mir after converting to Islam in 2016 & changed her name Mariyam Akhtar Mir. Mohsin was already associated with Congress & Now she is doing Al-Taqia in the name of FoE. BOOM reached out to Matondkar for a comment. Her manager laughed off the claim of Matondkar’s conversion and said, “it is a joke.” The article will be updated if and when the actress replies.